The Pushkin Giant jacket in orange brown and black was unique to the first printing. The Giant was published in spring 1943; inside the jacket is a spring 1943 list. The second printing in spring 1944 has the jacket in black brown and red. The change was made because Cerf didn't like the original jacket. I think he was right; the black jacket is more striking. By the way, I just noticed I don't have a copy of the black jacket. 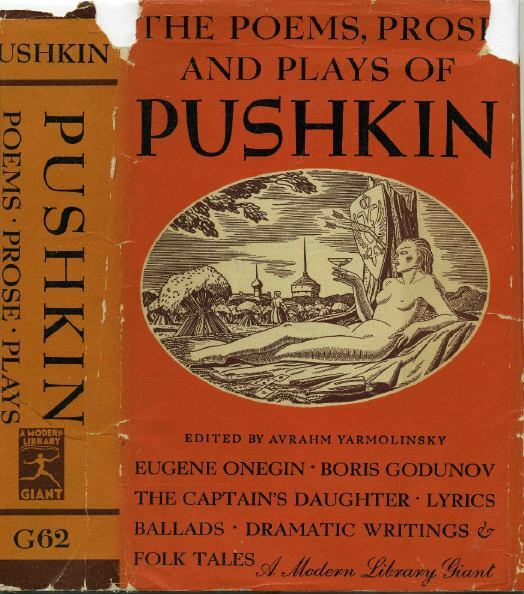 Does anyone have a copy of the Pushkin in a black jacket for sale? >Subject: [ModLib] Pushkin DJ unique to 1st? >"Existence precedes and rules essence."